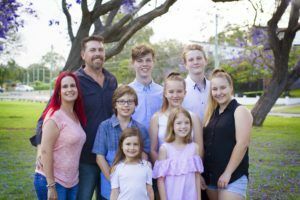 Brisbane mum-of-seven Simone Tobin has one big tip for parents who want to return to study while raising children. “Demand more from your family,” Simone says. “Women should all demand a bit more and say: ‘Listen you guys. I’m doing this thing, and you guys are just going to have to step up’. Simone and her gardener husband Paul have children ranging in age from 19 to seven. Connor is the eldest, followed by 16-year-old twins Constance and Zachary, and then Ava, 13, Braxton, 11, Delilah, 10, and Evangeline, 7. Simone, 37, admits she felt scared to return to studying 20 years after leaving school. She chose Monarch Institute for her Certificate in Bookkeeping and Accounting because it offered her the most flexibility to study in her own time. She enjoyed the certificate course so much that she has applied to study Monarch’s new Diploma of Payroll Services, tackling the complicated world of wages, long service, holidays, sick pay, redundancies and more. As a part-time office manager with a local ship building company, Simone hopes to put her new skills to good use at work. “When I first enrolled, even the idea of doing a literacy test was scary,” Simone admits. “I honestly didn’t know if I’d be able to do it. The latest Census data from the Australian Bureau of Statistics (ABS) shows that 114,800 women work in jobs while studying and caring for their children. The number of mothers who study has grown a whopping 9.6 per cent since 2011. And the proportion of mothers with post-school qualifications has greatly increased since 1996, from 23.2 per cent to 51.5 per cent. If you’re keen on hearing more about Monarch Institute’s qualifications in bookkeeping and accounting, click here. Or give our friendly Course Consultants a call on 1300 738 955.